«LASERWAR» company manufacturers continue to enrich the arsenal of outdoor laser tags with best replicas of weaponry. This time, we have decided to make a laser tag analog of MG-36 machine gun from the German company «Heckler & Koch». Our laser tag MG-36 «Kreuz» Original series game set is based on an airsoft body. It is made from high-impact ABS plastic. 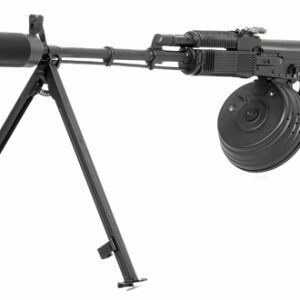 In the process of integration of our laser tag electronics, we have tried to retain body design features – its folding bipod and double drum magazine. Moreover, thanks to the excellent acoustic characteristics, the speaker located in the drum magazine gives a loud and quality sound. 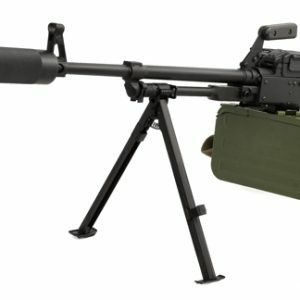 Also, we have kept the gun’s safety lock (it selects modes of fire) and a folding buttstock, but the gun safety lock has lost its functions, and the buttstock in the folded state can’t be fixed due to the structure of the double drum magazines. Activating of this game set is made with the key. The activation mechanism is located on the right drum of the magazine near the trigger. Recharging is made with the bolt on the top of the receiver. 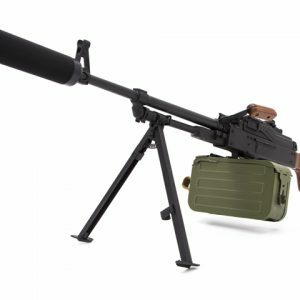 The game kit is equipped with a standard 1,5x optical sight, with a carrying handle and Picatinny rail located at the back of it.